If you have been hiding under a rock, and are not familiar with this song, check it out here. For the story on why Matt wrote this song, click here. I am fairly confident that every one of my Christian readers would agree with this thought. 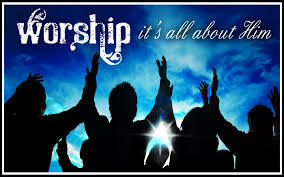 Worship is all about Him. It’s all about Jesus. If it is about anything else, it is false worship, or the worship of a false god. Worship has, indeed, been made into something of which we should be ashamed, because what we do, for the most part, is not all about Him. I have mentioned before that it is about the heart. God is concerned with the heart. There is no way that I can judge where a person’s heart is, especially in this area of worship. I assume for the most part that people’s hearts are intent on worshipping the Lord Jesus. I am only addressing what it is that we DO. Remember, it was David who was referred to as a man after God’s own heart (Acts 13:22), who sincerely wanted to worship the Lord, but caused someone to lose their life while attempting to do so (2 Sam. 6:3-8). I do not for a minute think the problem is with the heart of the people, but with the conditions under which they are being led in worship. Most churches do not have the resources for the spectacle that some churches provide—lights, smoke, multiple cameras finding different expressions of worship for the large video monitors, etc. This is the concert format for worship mentioned in the previous article that is a distraction to true worship. Yes, I know. Someone will immediately reach for the “comment” section on this blog to tell me how much they just love this type of experience and have felt the presence of the Lord in these places. I’m not going to argue with that. You may very well have felt His presence. There are many others, however, who would disagree—according to their own experience. This is the subhead to an incisive article about many of the problems associated with the concert-type worship events, whether at a ticketed ‘worship event’ or the weekly mega-church worship service. "The problem with these mountaintop experiences, whether legitimate (like Moses') or fabricated, is that the transformation does not last. In a few days time, or maybe as early as lunchtime, the glory begins to fade. The mountaintop experience with God, the event we were certain would change our lives forever, turns out to be another fleeting spiritual high. And to hide the lack of genuine transformation, we mask the inglorious truth of our lives behind a veil, a façade of Christian merchandise or busyness, until we can ascend the mountain again and be recharged." The goal is ‘transformation.” It is a term that has become very popular in this day, and rightly so. We desperately need to be transformed. Our society needs to be transformed. Our country needs to be transformed. Our world needs to be transformed. World-wide transformation is at the heart of the Bethel School of Supernatural Ministry. It is the purpose of the School of Transformation, a ministry of Dare to Beleive. There are many others using this term to promote their view and ministry of what God is doing in the land today. And so, back to the idea of worship as a transformational experience, are you changed in any long-term way by your worship experience? I recall a time early on in my walk with the Lord when a brother came back from a meeting all excited because he had been “slain in the spirit.” I didn’t say anything, but I immediately thought, “And how has that changed your life?” Sadly, his life didn’t change. If transformation is what you seek for your worship services, what would it look like if you suggested this post to your pastor, or the article about Matt Redman? What would it look like if you “stripped everything away” in an attempt to return “to the heart of worship”? Thought provoking...I was wondering some of these very same things last night, while we had a more spontaneous time of worship last night. I am personally being challenged about this concept of having a heart of worship, and how to allow for an environment for that to be expressed!!! Thank you for your input. Stay tuned. The next article begins (ONLY BEGINS) to reveal some of the things that allow for a worship environment.